I've heard some people talking about Saigon instead of Ho Chi Minh City. Besides the fact that those people usually were French (I'm French myself as well) I was wondering if that could be considered offensive by the Vietnamese people. As Saigon is the old name, they might feel a bit weird if someone was reminiscing about the "good old days" when Vietnam was a French colony. ... The river still remains Saigon. Buses still flash "Saigon" as their destination. The largest state run tourist company is Saigon Tourist. The three-letter airport code is SGN. In fact, the city's District 1 officially remains Saigon. So go ahead and say it. So, yes, it is unlikely to offend anyone. My wife is Vietnamese, and her entire family. I also visited Vietnam with them previously. They all spent most of their life in Vietnam prior to moving to another country. When I inquired (while visiting) they explained the name change, nothing was mentioned about it being offensive. Also while visiting I saw a large number of shops/etc that referenced Saigon. I believe that the name change is not a sensitive subject, simply a political matter and as such holds very little in terms of being offensive to anyone. Most locals were referring to it as Saigon however rather than Ho Chi Minh (noted generation differences - younger seemed to use Ho Chi Minh & Saigon interchangeably). I was born and grew up in Saigon. Saigon has always been and will forever be Saigon. Don't call it by any other name! A historical allusion to these naming is Leningrad, which, similar to most authoritarian states tendencies, was imposed upon the people through violence, bloodshed, oppression. After almost 70 years, Leningrad (Stalingrad as well) has finally returned to its original name, St. Petersburg. Saigon will be Saigon once again when the people are free to call their beloved city by the name they have always held dear in their hearts. They will quickly bury the name HCM (a nom de plume, meaning roughly "the enlightened seeker") in the dustbin of history once they are free to expose what's really behind these oppressive names. This is not unlike the once-god-like names of Lenin and Stalin and other oppressors. The name Sàigòn, by the way, has nothing to do with nostalgic French colonial days. The name signifies a simple cultural root and refer to the Gòn tree (Kapok tree). I grew up playing with the cotton pods from that tree, and often hiding under its huge shade during the hot or raining days. My wife is Vietnamese, I speak the language at a relative fluency, have visited multiple times and am moving to Saigon in the near future. HCM City is the official government imposed name. Saigon is still the popular informal name. If you say "Saigon" while in the country of Vietnam you MIGHT irritate some of the ones wearing pea-green uniforms if you're in the north. No one will care in Saigon. I don't know how Vietnamese expats living in France feel, but in the U.S. you could offend some by saying "Ho Chi Minh City" - particularly the older generation who fought in the war. In fact, the only time they will utter the name "Ho Chi Minh" is in a euphemism for using the toilet (literally: "Go visit uncle Ho"). Recent immigrants tend not to care very much. If you want to avoid ever offending anyone: Say "Saigon" while outside the country. Say "Ho Chi Minh City" while in Hanoi. Say either while in the city itself. No. Everyone will be fine with it. Ho Chi Minh City is the official name of the city, you need to use it in all paper work. No exception. The Vietnamese who stays in Ho Chi Minh City and its outskirt call the whole city as "Thành phố" or "The city". Sài Gòn is used to call its District 1 area, or more specific, the Bến Thành market area. In 2012, the city bus which headed Bến Thành Bus Station was labeled that they headed Sài Gòn. 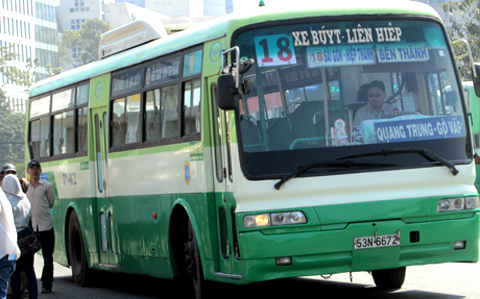 For example, this bus, which connects Bến Thành and Hiệp Thành, was labeled 18 Sài Gòn - Hiệp Thành, Bến Thành is a sign for the newcomers, who hasn't gotten familiar with custom. In addition, the main railway station of the city is named Ga Sài Gòn. And Cầu Sài Gòn (Sài Gòn Bridge), Cảng Sài Gòn (Sài Gòn Harbour/Port) still exists. The West-Southerner and East Southerner tend to call the whole city as "Thành phố" (the city). Sài Gòn is also called occasionally. The Central Vietnamese (including me), call the whole city (and, sometime, its outskirt likes Lái Thiêu, Biên Hoà, Vũng Tàu, etc...) as Sài Gòn. The Northerner tend to call its official name except when they know that they're talking with a Southerner. The media use 2 names interchangeably. Personal speaking, I don't find any offensive with both 2 names, we like to call it Sài Gòn or Thành phố because it's short. The Vietnamese people hate to call anything with more than 2 syllables. 2 is enough, 3 is too long. I'm Vietnamese born and raised in Saigon. No, most Vietnamese would not be offended if you were to use Saigon instead of HCM. I said "most" because obviously there will always be a minority of people who are unhappy about something. I imagine that if you were to run into one of these people, they're most likely brainwashed nationalists who revere HCM -- these people can be found near the northern regions of VN near the capital, Ha Noi. I guess i should correct myself and say that most "Vietnamese in Saigon and abroad" prefer the old name. One is simply that Ho-Chi-Minh City is the official name. Calling that city Saigon is somewhat like calling Tokyo by its former name Edo, calling India's Chennai Madras, calling the US state of Utah Deseret, calling New York New Amsterdam, calling the German city of Chemnitz Karl-Marx-Stadt, calling Saint Petersburg Petrograd (or Stalingrad or Leningrad), calling Kaliningrad Koenigsberg, and so on. Renaming of cities is quite common. The other part is the history of the new name. Ho-Chi-Minh dates back to a particularly bitter period in Vietnamese history, the Vietnam War. The name was deliberately chosen as a "slap in the face" to humiliate the South. As a result, some people may be offended if you use the official name, while others may be offended if you use Saigon. Vietnamese residents (southerners) refer to the central urban area (Districts 1 and 5) as Sài Gòn, and as a destination on transport, it's usually Sài Gòn. The expat community tend to use Saigon to indicate all of HCMC, but it leads to confusion with the locals. Northerners tend to laugh, and just call it Thành phố Hồ Chí Minh. But that's because they're always pulling the southerners' legs. Historically, it was only the central urban areas that were called Sài Gòn, but that's because the rest of the city was farmland. Source: I lived in Bến Nghé (Sài Gòn, west of the river) and Bình Thạnh (not Sài Gòn, east of the river) for two years, learned Vietnamese, had local friends. It's pretty like Saint Petersburg to Leningrad, Aéroport de Paris Nord to Aéroport de Paris-Charles-de-Gaulle or Edwinton to Bismarck. Calling the city Sài Gòn could be considered offensive: NO. But note that in formal or official cases, the proper name of the city is Hồ Chí Minh City. Calling the city Sài Gòn may make people reminisce about the "good old days" when Vietnam was a French colony: NO. The name Sài Gòn had been used even long before the French legions came to Việt Nam. On the contrary, calling the city Hồ Chí Minh may annoy or even offend a number of Vietnamese Americans (those who left the country as a result of the Vietnam War). The fact that people in Việt Nam use Sài Gòn as the city's name in verbal conversations may result mainly from historical and/or linguistical backgrounds.The word Sài Gòn has a history of some hundred years, long enough to act not only as a place name. Also, it is a two-syllable word, much easier to pronounce than Hồ Chí Minh (note that a great majority of Vietnamese place names are two-syllable names). Besides the historical and linguistical reasons, that Vietnamese people outside Việt Nam use Sài Gòn as the city's name is largely due to political factors. In brief, when you are in Việt Nam, there is no problem to refer to Hồ Chí Minh City as Sài Gòn when talking. Howvever, you are required to (and had better) use its official name in formal and political contexts. I live and work in Ho Chi Minh City. Saigon to most people is 1, 2, or three things. the suburb known as district 1 which was once the original old town of Saigon which grew outward from the river. The airport... name for IATA refers to the city as Saigon (SGN) so all airlines that land in Ho Chi Minh City are travelling to and landingin Saigon. No one in Vietnam (that I've met) is at all upset if you call it Saigon. I am a native Hanoian and to me, Ho Chi Minh city and Sai Gon can be used interchangeably, nothing offensive. People like me more consider Sai Gon as a short, convenience and informal name of Ho Chi Minh city. However when I first came to HCM city more than 20 years ago, I realized that local people refer "Saigon" to the central district #1 and the adjacent areas only, while calling just the "city" for the HCM city in general. I stayed at that time in the district #5 of HCM city, a part of the historic Cholon as called by the local people, and is a part of the "city". So in short, it is not offensive to MOST people in Vietnam to hear the name Sai Gon instead of HCM city. But those are not the same for original local residents of HCM city. I'm Vietnamese and here's the fun fact: "Ho Chi Minh city" is the official name of the city but Vietnamese people rarely call that name, we prefer Saigon. Why? For some people living in South Vietnam, it's a politic matter. But for th rest, even people from other regions prefer Saigon because that name is simply shorter. So just use Saigon freely, some people might like you more for callinng that name. True story. Not the answer you're looking for? Browse other questions tagged local-customs vietnam ho-chi-minh-city or ask your own question. Visiting Derry/Londonderry. What should I call it? Transportation and cost to get to Tay Ninh from Ho Chi Minh City? What are the current requirements and process of obtaining a multiple-entry Chinese visa for an Australian citizen in Ho Chi Minh City? Is there a bus or train that goes from Bangkok to Ho Chi Minh City? Are there any luggage lockers in Ho Chi Minh City?